Sabator was a minotaur-like Bakugan. It was Nurzak's Guardian Bakugan. It can evolve into Gren. Sabator was partners with Nurzak of the Twelve Orders. Sabator is a powerful fighter, he manipulates the energy of the ground and unleashes attacks from every direction. He spins the drills on his shoulders and charges at his opponent. Sabator is a bit of a wild one that enjoys taking risks. His Battle Gear was Chompixx. Sabator is already released along with Lumino Dragonoid, Akwimos, Aranaut, Hakapoid, and Krakix in North America. Its Haos, Aquos, and Pyrus Version are rare. It can be attached to Battle Gear by pulling it's arms down and flattening it's tail and legs backwards. 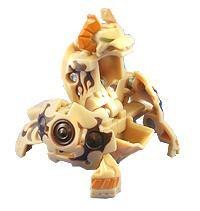 Purchase your Sabator Bakugan from Amazon now!